Home jQuery jQuery Plugins SVG Fallback How to fallback to PNG if SVG not supported? How to fallback to PNG if SVG not supported? SVG or Scalable Vector Graphics image format has suddenly become popular for showing images on your website and its future graphic format. But not all browsers supports SVG format and that's why SVG format was not so popular though it exists from 1999. So in this post, we will find how to fallback to PNG format if SVG is not supported by browser. SVG images are vector based! Meaning that they will be as sharp as hell no matter how big they are. SVG files are smaller and easier to compress than other formats. Graphics with SVG will print in a higher resolution. Editing of SVG can be done with even Notepad. SVG images are zoomable and scalable. Like other graphics, SVG works as a static or animated image. SVGs use XML to define paths and shapes, to create our graphic. Recommended reading "Why Use SVG - What are the Advantages". 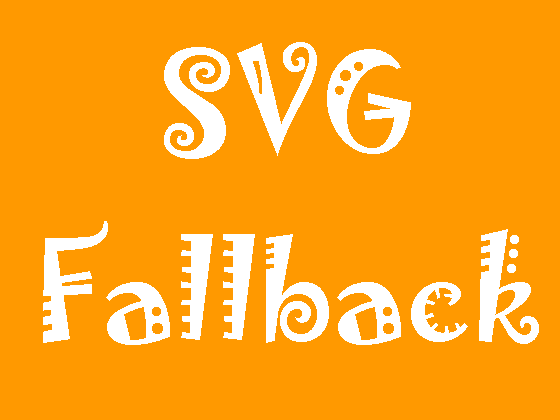 There are couple of solution for SVG fallback. So, once it is detected then you can fallback to PNG using a simple jQuery script. The above script will find all the image with src "svg" and then replace the extension with PNG. Just download the SVGMagic.js script include it and initialize it. SVGmagic checks which browser your visitor is using. Is it a browser that doesn't support SVG images, than it starts the magic! First of all the script will check which images on your website are SVG and collects their URLs. These URLs are then send to our server which will temporarily download, convert and save them. When that's done the server send back a package with new URLs. The SVG images on your website than get replaced by the new PNG images and your old-school visitor can see the 'SVG' images. SVGeezy is in essence, a fallback plugin. It allows you to use SVGs for all your assets, giving you complete resolution independence. It checks if the browser supports SVGs, if not, changes the src of the image to a .png instead (or whatever you pass in). Just download the svgeezy.js script include it and initialize it. If you are still not using SVG, then start using. SVGs are resolution independent, meaning responsive design. SVG images can also be created directly in your HTML document, without even having to save the file itself.